Because we have shapefiles (GIS data files) of the Chicago precinct boundaries from Tuesday's 2015 Mayoral election we can use software to match them up against any other data set where we have shapefiles, including 2010 US census data. I ran an intersect on the precinct boundary shapefiles against the 2010 census data by census tract (and then prorated the vote totals based on the percentage of land area overlap) so that I could merge data on median household income, education as measured by the percentage of people in a census tract that had a bachelor's degree or higher and also a much more granular estimation of race than the tracker from the other night. It yielded some interesting results. Early voting starts in a little over three weeks (March 23rd) so these two candidates have very little time to persuade voters. It will be interesting to see which of these two campaigns tries to win over new voters vs. which ones just focus in increasing turnout among the subsets of voters where they have the most support. It probably won't come as a surprise for you to learn that the Mayor did better with affluent voters than the less affluent voters but it did surprise me to learn that a small majority (50.3%) of voters on Tuesday live in census tracts where the median household income is less than $60,000. The Mayor only won that group 41-34 as opposed to the people who live in census tracts with median household income above $60,000 where the Mayor's margin was greater at 50-33. There is a pretty clear financial divide for these two candidates that may prove beneficial for GOTV strategies. In census tracts with a majority Hispanic population Garcia won an outright victory 56-34, however only 15% of Tuesdays voters live in those areas. On the other hand Emanuel won a clear victory in census tracts with a majority white population 53-32 and 37% of Tuesday's voters live in those areas. Even though Garcia has a natural base with Hispanic voters that base is smaller than the voting population of other ethnic groups. 34% of the voters who live in majority African American census tracts voted for one of the candidates that didn't qualify for the runoff, these voters are now coveted by both candidates. Among the voters who live in majority African American census tracts Emanuel's support is roughly the same regardless of household income. For example the AA voters who live in census tracts with a median HH income between $0 - $20,000 supported him at 42.5% while the AA voters with median HH income between $80,000 - $100,000 supported him at 41.5%. On Tuesday Emanuel won the support of more AA voters than any other candidate and whatever message it was that won him that support seemed to work the same regardless of the voter's income. On the other hand, Garcia's support among the voters who live in majority AA census tracts did vary by income and he had greater support among the more affluent African American voters than the less affluent. For example the AA voters who live in census tracts with a median HH income between $20,000 - $40,000 supported him at 21% while the AA voters with median HH income between $100,000 - $120,000 supported him at 36%. Garcia has two challenges here 1) he earned a greater rate of support among affluent AA voters on Tuesday but the vast majority of the AA voters on Tuesday came from the less affluent census tracts (1/3 of the AA voters came from tracts with median HH income less than $40,000 and 82% less than $60,000) so he'll have to tailor his persuasive message toward the less affluent if he wants to improve his support rate, and 2) he has a difficult needle to thread in that his best GOTV strategy for the city overall is to focus on voters in < $60,000 census tracts while his best performing AA subsets are the more affluent ones. Voters in majority white census tracts tended to be somewhat more affluent than their counterparts in majority AA or majority Hispanic census tracts. For example only 7% of voters who live in majority white census tracts had a median HH income under $60,000 whereas 82% of voters who lived in either of AA or Hispanic majority census tracts had a median HH income under $60,000. So voters in majority white census tracts tend towards the higher income brackets compared to their counterparts in AA or Hispanic majority tracts and there is a clear correlation between an increase in income bracket and an increase in support for the Mayor but there is still a ray of hope for Garcia among middle class white voters. A good majority of white voters (59%) live in census tracts with a median HH income between $60,000 - $100,000 and of all of the subsets of white voters this is where Emanuel did the worst, falling just below 50%. Also, even though Fioretti didn't win much support anywhere this was the subset of voters where he was the strongest. Garcia has the opportunity to make some inroads with middle class white voters. When I ran the numbers I included data about education as measured by the percentage of people in each census tract that had a bachelor's degree or higher but I haven't included this data in this analysis mostly because those numbers track pretty closely to the income bracket numbers. Higher income areas tend to have a higher percentage of college educated people so the conclusions tend to mirror one another. Election day is a little more than 5 weeks away and in a little more than 3 weeks early voters can start casting ballots again so there isn't much time to turn out voters and there is even less time to win over new ones. For either campaign to emerge successful they're going to have to study these data subsets and find their winning formula. Late last night the Chicago Board of Elections made their ward by ward (and precinct by precinct) numbers available and I was able to plug those numbers into the tracker I would have used had those numbers been available earlier in the night. Most of these insights are derived from a quick glance at the tracker. In majority AA wards (by census) Emanuel (42%), Garcia (26%), Wilson (22%), Walls (6%), Fioretti (5%). In wards with an AA majority 32% of the vote went to candidates that will not be in the runoff so it will be interesting to see where these voters fall. In majority Hispanic wards (by census) Garcia (52%), Emanuel (37%), Fioretti (7%), Wilson (3%), Walls (1%). Only 11% of this vote went to candidates not in the runoff. In wards with a white majority (by census) Emanuel (52%), Garcia (34%), Fioretti (10%), Wilson (4%), Walls (1%). 15% of this vote went to candidates not in the runoff. 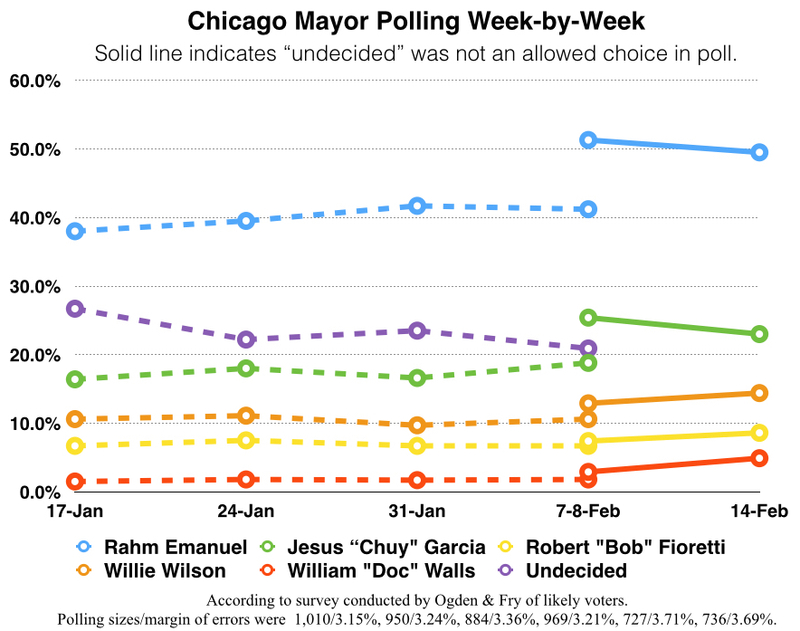 In wards with no majority (by census) Emanuel (49%), Garcia (35%), Fioretti (9%), Wilson (5%), Walls (1%). 15% of this vote went to candidates not in the runoff. Reminder, the "2011" numbers in my tracker were reconfigured to match the current ward maps. In the majority AA wards the 2015 numbers for Emanuel were about 12-20 points lower than 2011. It was harder to draw conclusions about the Hispanic majority wards, some showed Emanuel improvement (10/13/14/31), others big drop (22/25/33/35). In only a very few wards did Emanuel improve over his 2011 numbers but somehow in the 13th ward he did almost 15 points better. Interesting. It appears that 19 aldermanic races are headed to an April runoff (2, 7, 10, 11, 15, 16, 18, 20, 21, 24, 29, 31, 33, 36, 37, 41, 43, 45, 46). So while the overall numbers were Emanuel (45%), Garcia (34%), Wilson (11%), Fioretti (7%), Walls (3%), if my math is correct in just the 19 wards that are headed to aldermanic runoff the numbers were Emanuel (46%), Garcia (31%), Wilson (12%), Fioretti (8%), Walls (3%). The Mayor did slightly better than average in these 19 wards but there is also 23% of the vote in these 19 wards that went to candidates that won't be in the runoff so it will be interesting to see where those voters fall. Obviously these 19 wards are likely to have higher turnout in April than the wards without Aldermanic elections. Of the 21% of voters who voted for one of the candidates who didn't qualify for the runoff, where does their support go? These voters are largest among wards that have an AA majority by census so you'll likely see a significant focus of the campaign in those communities between now and April. Can Garcia expand on his 52% of the vote in Hispanic majority wards and can the Mayor continue to make inroads among Hispanic voters despite having a Hispanic candidate in the race? What happens in the 19 wards with Aldermanic runoffs and how does that affect the Mayor's race? Now we have a six week sprint until April. As I mentioned before starting with the 2014 General Election the Illinois State Board of Elections has made precinct-level vote totals available for all races. The State Board offers flat files in csv format for each of the state's election authorities. I have assembled that data, formatted it and created some interesting tools. Download Raw/Formatted Data - Click here to download 1) all of the raw data aggregated from the State Board of Elections (flat file); 2) a statewide csv file of all races formatted for use (flat file); and 3) a sample Microsoft Access database that uses the full statewide formatted file plus has some query examples that demonstrate how the data can be used. View Race by Precinct - Click here to select a race and view the election results by precinct. Every race except for the statwides can be viewed by precinct, the statewide races are too large to load on the screen. Instead there is an option to download each of the statwide races that can be opened in any spreadsheet program. View Race by County - Click here to select a race and view the election results by county. This code aggregates the precinct-level database into county by county results. If you are concerned that there is an error in the precinct-level database file you can use this tool to view the county by county totals and compare them to the certified election results and check for discrepancies. View Statewide Race by Districts (Simple Method) - Click here to select a statewide race and view the election results by districts (congressional, state senate or state rep). This process uses the simple method, which has to do with instances where more than one district are represented in a precinct. Using the simple method the entire precinct data is used for any precinct that is in part or in whole in each district. More complicated methods may be available in the future. The statewide file is large, it's about 1.8 million records so some pages may take a few seconds to load. Also, when looking at statewide races by district (congressional, state senate, state rep) currently the only method available is the Simple Method which includes any precinct that is in whole or in part in the district. I hope to be able to add a more complex apportionment method where precincts that include more than one district have those votes apportioned to one district or another. For reasons I won't get into you can't guarantee that one method is more accurate than the other but the apportionment method is generally favored. If you'd like to develop your own methodology for evaluating the data I have made the raw and formatted data available for easy download so you can use it as you wish. In the meantime I wanted to publish what I had here so I could move on to finishing up the maps and then get the 2014 monthly campaign budgets done later this month. Feel free to contact me with any questions at Scott.Kennedy (at) illinoiselectiondata.com or on Twitter at @ILElectionData. Tonight the Illinois State Board of Elections will meet to certify the election results. Once those results are made available I'll start work on updating the site with all of the data from the 2014 general election. I should have all of the election profiles and the analysis spreadsheets (updated) updated pretty quickly, probably sometime this week. The maps will probably take a little longer. I only add new maps about every two years and it seems like each time I do Google has added some new security protocol to the batch update process and their documentation is rarely helpful. I will get them done as soon as I can. Beginning with the November 2014 general election and every primary, consolidated, general, and special election thereafter, within 52 days after each election, the State Board of Elections shall publish the precinct-by-precinct vote totals on its website and make them available in a downloadable form. That should happen no later than around Christmas. I have no idea how the State Board plans to implement this but hopefully it should allow us to parse the data in all sorts of ways including a) seeing how the Governor's race candidates (or other races) performed by congressional, state house and state senate district and b) seeing how the statewide referenda fared in each district, etc. I have zero interest in replicating any functionality offered by the State Board of Elections but if all they offer is raw data and it is in some sort of format that will allow us to convert it into a usable database I'll probably spend some time building some functionality so that it can be parsed in various useful ways. And then come January the final campaign finance reports for this election cycle will be filed for both federal and state candidates. Once those reports are filed I'll get to work on updating the budgets for each race. That is a lot of work and takes a long time so it won't happen right away. Also now that the results are certified I may write some articles looking at the results in depth. There are a number of topics that interest me including following up on pre-election articles about the downstate vote, the Chicago vote (especially the African American vote in the Govenror's race), the death of the Cook County suburbs as a reliable bellwether, the stronger than expected performance of some of the challengers in the down ballot statewide races, that razor thin Treasurer's race, the competitive congressionals and turnout and vote share. I may not get to all of those topics or I may find that there is nothing new to add beyond what's already apparent on the surface but for now those are the topics that interest me and seem likely to offer greater insights once looked at more closely. The Chicago numbers came in just before 9pm and as expected it boosted Frerichs lead by over 6,000 votes. I did a complete check of all the election authorities again and the only other update was Marion County. On my tracker I still have not yet confirmed the final totals for 50 of the state's 110 election authorities. Of that number 14 don't have websites and the other 36 just haven't updated their websites yet with final totals. The current margin is Frerichs by 9,439 votes. Reminder: I will be traveling all day tomorrow for work and won't be near a computer probably at all so I will have no new updates for you. I gave Rich Miller and his intern access to the Google Doc that powers the tracker so they may make updates or they may not. Either way I'll find some time on Thursday to update what I can. Here's where things stand right now. I have checked every publicly available source of election results since 5pm. As of this writing Frerichs has a lead of 3,259 votes but 52 of the state's 110 election authorities have not yet published what is clearly a final update. You can see which counties updated here. The City of Chicago still has not updated, which is expected to produce a notable margin for Frerichs. The Cook County suburbs did make an update of 8,314 votes and Frerichs net gain there was 2,263 votes. The most surprising news of the day came in the collar counties. In the 5 traditional collar counties overall Cross beat Frerichs 57%-38%. I expected that the updates in the 5 collar counties would give Cross the net gains he would need to keep this race close. That was not the case. We haven't had a public update in McHenry County since 11/5 and did not get one so far today. DuPage had a large public update on 11/5 as well, both producing large margins for Cross. However in today's updates it was Frerichs who came out with a net gain in Lake and Will (472 and 376 votes respectively) while Cross' net gain today in DuPage was only 48 votes. The Kane County part outside of Aurora updated last night Cross gained 215 votes while the Aurora election authority update today gave a net gain to Frerichs of 235 votes. In these most recent collar county updates it was Frerichs who had a net gain, when I was expecting a large net gain for Tom Cross. In the overall statewide vote the 5 collar counties made up 25% of the vote in this race, while the Cook County suburbs made up 19% of the total vote. Cross needed gains in the collar counties to blunt the gains by Frerichs in Cook County and what is expected in Chicago. Unless McHenry comes in with a very large update, that didn't happen. This race has had many surprising developments. Now Tom Cross is going to need to find votes in surprising places to make up the current deficit. I will update what I can when I can today. Keep track of which counties updated here. Here is what to expect for tomorrow and Wednesday. I expect the clerks will finalize and update the vote totals in each election authority tomorrow. The clerks will still have to complete the canvass and the totals won't yet be certified but at least we won't be expecting any further updates unless errors are found. Technically the clerks have to wait to make sure no additional ballots come in the mail tomorrow so the updates are more likely to come later in the day. I will take a late lunch and check for updates during my lunch and then again after work. On Wednesday I have to travel for work and will not be able to check for updates at all. I have given Rich Miller and his intern access to the Google Doc that is keeping track of these totals so they can make updates if needed. Also, if you need to get updates faster anyone can copy/paste the data at the bottom of my tracker where it is listed by election authority and perform their own checks. To make it easier to quickly see which totals are final I have them color coded. All the numbers for each election authority in blue are not yet final, the numbers in black are the numbers that are expected to be final. For previous updates I've written a little blurb after each one explaining the update. Here is that history in table format. Since almost all 110 election authorities are expected to have an update in the next day or two I probably won't write up each one, I am going to try to keep this table up to date and just reference the table. First, thank you to Macoupin County Clerk Pete Duncan for emailing me his final county totals, that was very helpful. Second, if you look at the very bottom of the tracker where the vote totals by election authority are listed you'll notice that many figures are in blue. Anything in blue is not yet confirmed as final, anything in black is assumed to be final pending the canvassing and certification. DeWitt County - there were a total of 5 new votes over what was previously publicly reported and Cross gained 4 votes. These should be their final totals. Jasper County - there were a total of 4 new votes over what was previously publicly reported and Cross gained 4 votes. These should be their final totals. Marshall County - there were a total of 10 new votes over what was previously publicly reported and Cross gained 4 votes. These should be their final totals. Pope County - there were a total of 3 new votes over what was previously publicly reported and Cross gained 1 vote. These should be their final totals. Richland County - there were a total of 29 new votes over what was previously publicly reported and Cross gained 9 votes. These should be their final totals. Macoupin County - there were a total of 79 new votes over what was previously publicly reported and it was a push, the margin remains exactly the same. These should be their final totals. Bond County - there were a total of 2 new votes over what was previously publicly reported and Cross gained 2 votes. These should be their final totals. Morgan County - there were a total of 123 new votes over what was previously publicly reported and Cross gained 41 votes. These should be their final totals. Pike County - there were a total of 4 new votes over what was previously publicly reported and Cross gained 3 votes. These should be their final totals. Fayette County - there were a total of 26 new votes over what was previously publicly reported and Cross gained 11 votes. These should be their final totals. Kane (only, not including Aurora) - there were a total of 382 new votes over what was previously publicly reported and Cross gained 215 votes. I'm not sure if these are their final totals. Vermilion (only, not including Danville) - there were a total of 81 new votes over what was previously publicly reported and Frerichs gained 1 vote. These should be their final totals. The current margin is now Tom Cross by 674 votes.